Recently I was able to take eight days and visit some of my family in Ontario. 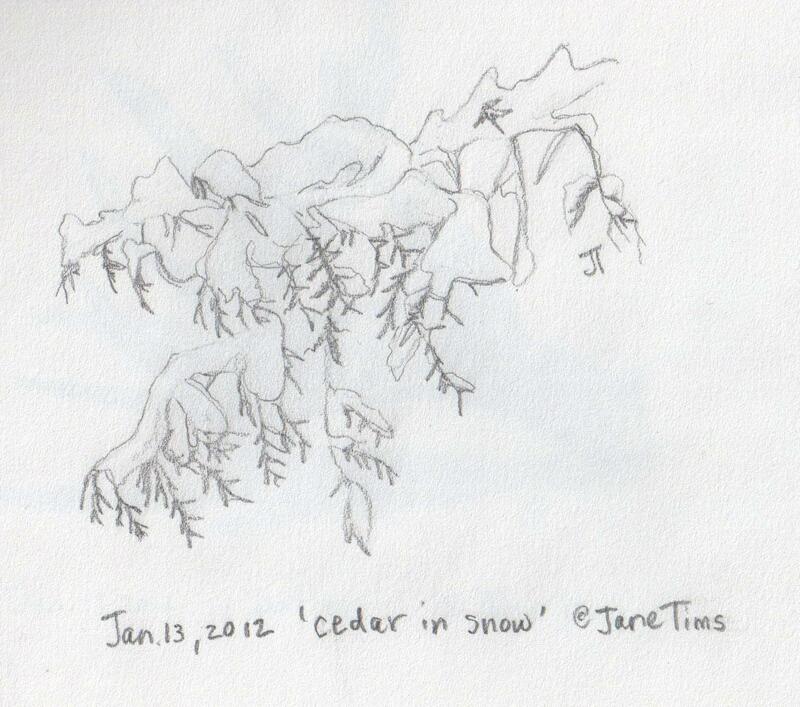 While I was there, I spent some time drawing and writing. 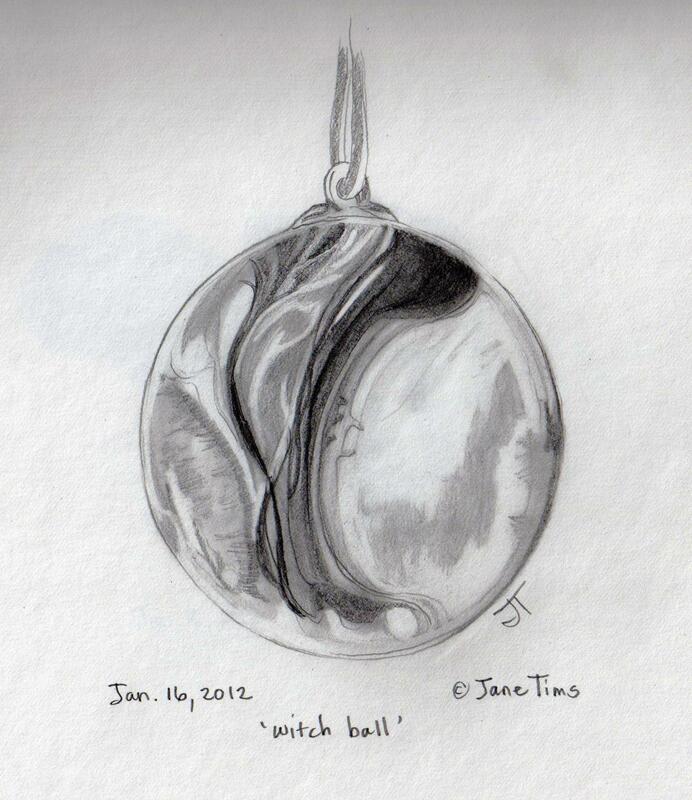 In the next few posts, I will show you some of these drawings and the poems I wrote to accompany them. 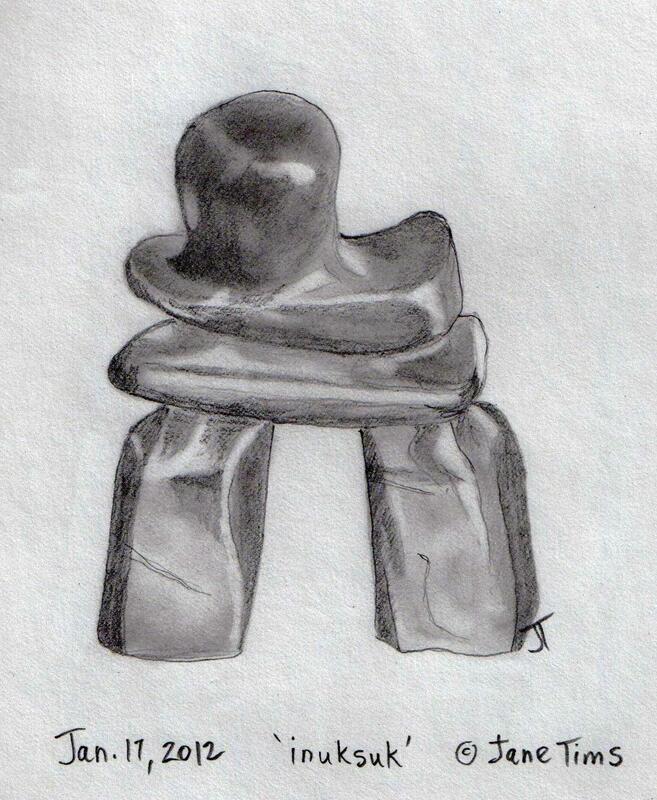 The first concerns a small statuette of an inuksuk, carved in northern Canada by an artist who created a gentle, thoughtful tribute to this traditional form. For more information on the inuksuk, see my post for November 18, 2011, ‘monuments in stone’, under the category ‘the rock project’. At my Mom’s old home, there was a shed, housing the stored and discarded miscellany of her family. It had been built by my uncles in the distant past and the floor tipped and slanted after the settling of years. The shed had a special smell, not musty or unpleasant, but definitely tinged with the smell of mothballs and camphor. There were two rows of shelves, built against the walls and around the small windows. 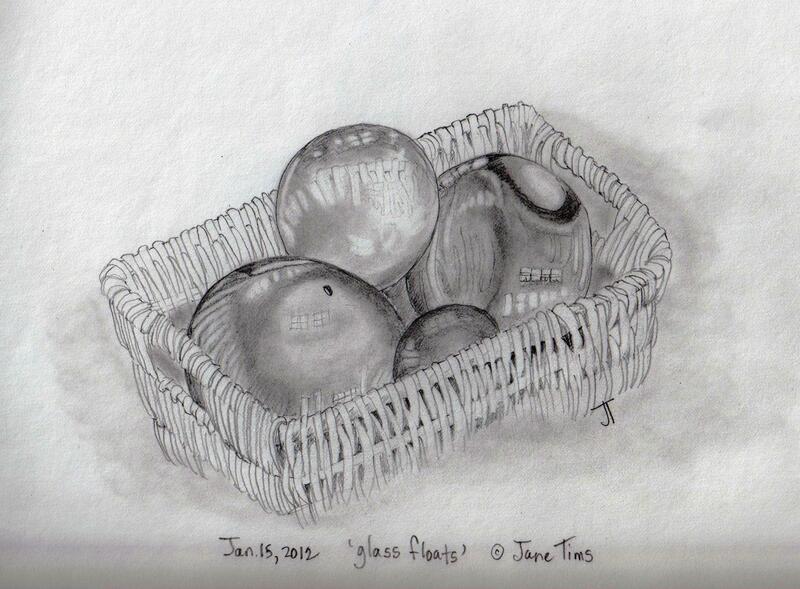 These were grubby and cracked, but the quality of light shining through had a ghostly, ephemeral quality. I spent hours in the shed, armed with the assurances of my aunt … I could keep anything I found, as long as I promised to love and care for it. I can never remember studying anything so intently as the items stored in the shed. I particularly remember an old trunk and its contents. Most of these were old clothes, but I found a fox fur with beady glass eyes, a fur muff in a linen bag, a small carved metal container my Mom said had once contained perfume, a small locket with a medical insignia, and a little embroidered tape measure and matching needle case. I also found two small framed pictures of flower arrangements. All of these things are still in my possession. The fur muff has been taken on our annual drive to see the Christmas lights for 31 years. I also found a bolt of white lacy fabric I eventually used to make my wedding dress. This fabric had an important history since my grandmother had worked as a live-in nurse for the Carnegie family in Pennsylvania and received the lace as a gift. 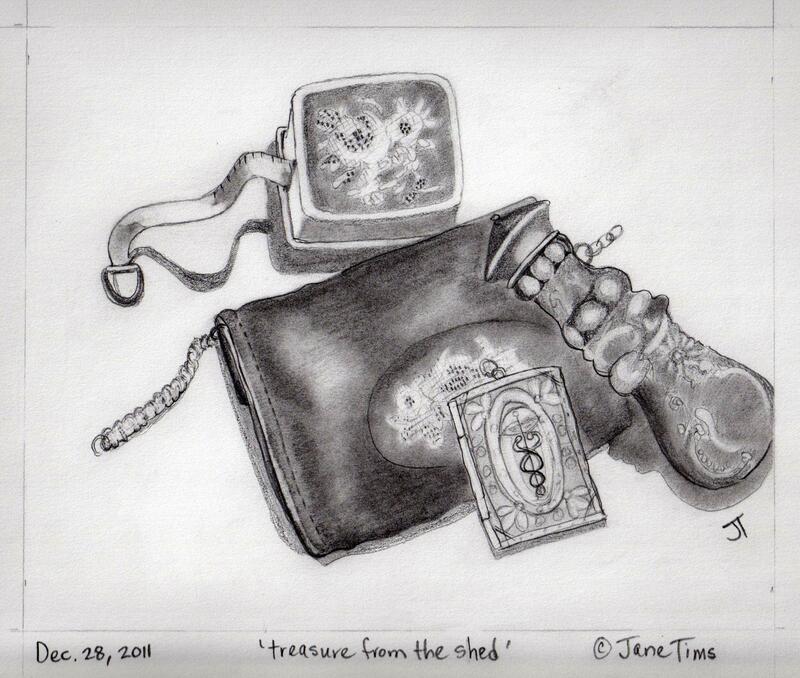 I think the shed and its contents inspired in me a lifelong interest in antiques and in collection. One of my favourite places to spend time is in an antique shop, hunting for treasure. And my house is filled with old ornaments and books, rickety chairs and collectable dishware. Our Hairy Woodpecker was back today. She was determined to get to the feeder, so we got a very good look at her in all her black and white splendor. This time the identification was not a problem. This woodpecker is a noticably large bird, compared to the smaller Downy Woodpeckers we have seen at the feeder before. 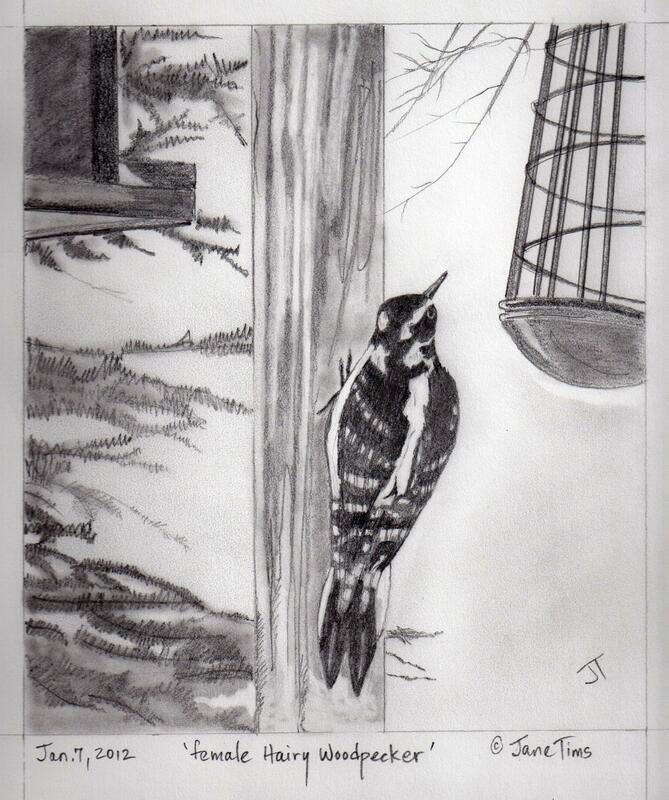 Also, the outer tail feathers are white, not marked in black as they are with the Downy Woodpecker. 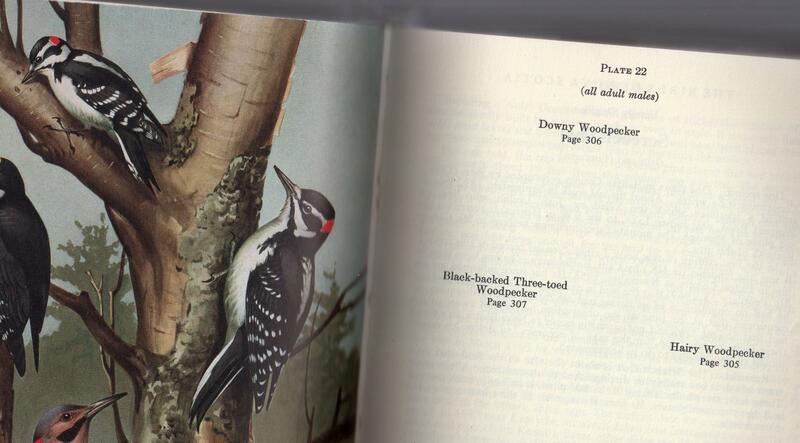 Roger Tory Peterson, 1980, 'A Field Guide to the Birds East of the Rockies', Houghton Mifflin Company, Boston. 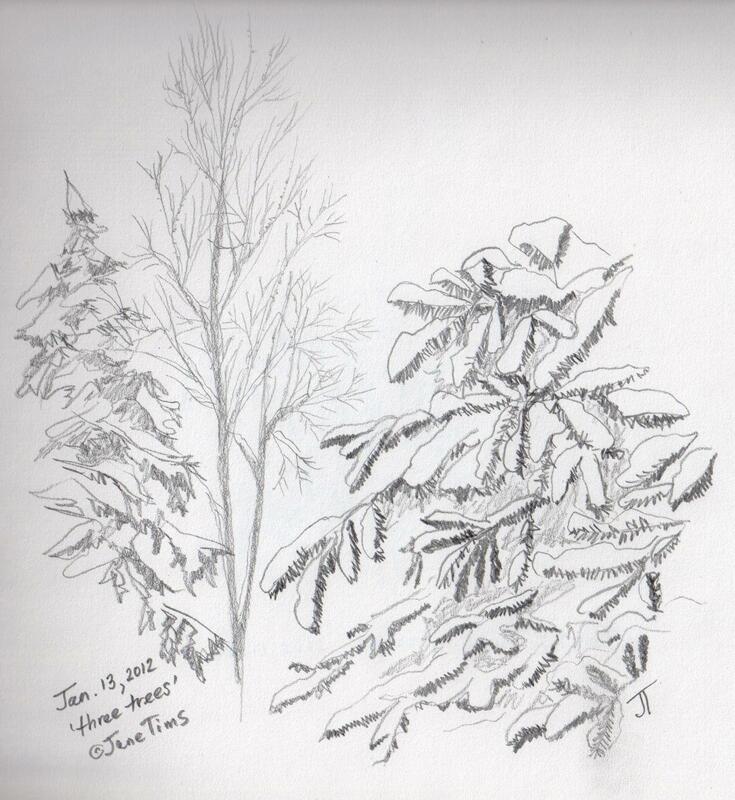 … and second, from his illustration in ‘The Birds of Nova Scotia’ by Robie W. Tufts (1973). 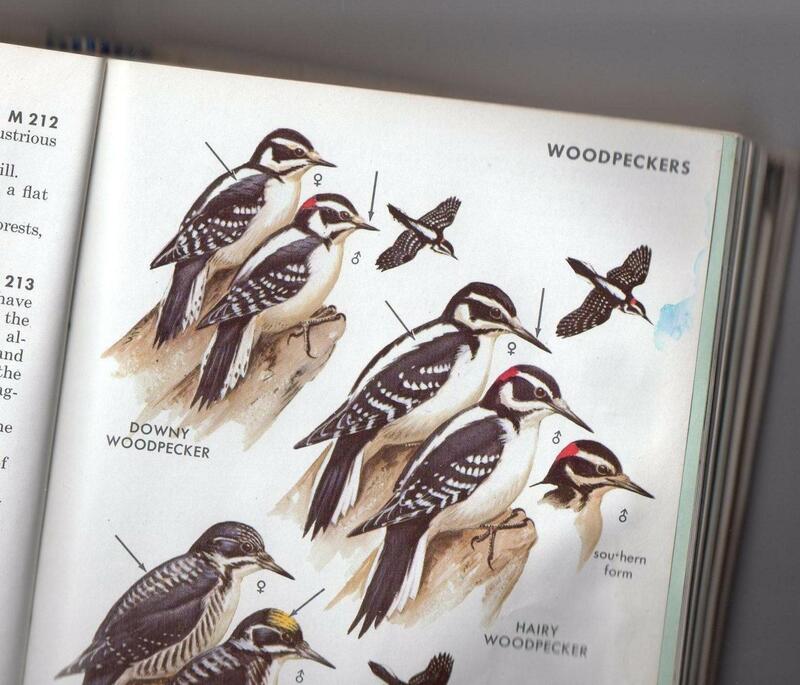 In the ‘Field Guide’ , the markings on the white tail feathers of the Downy Woodpecker are clearer. Robie W. Tufts, 'The Birds of Nova Scotia', 1973, Nova Scotia Museum, Halifax. Color illustrations in this book are by Roger Tory Peterson. Both Downy and Hairy Woodpeckers are cavity nesters. They stay through the winter and are frequent visitors at feeding stations… they love suet and black sunflower seeds.